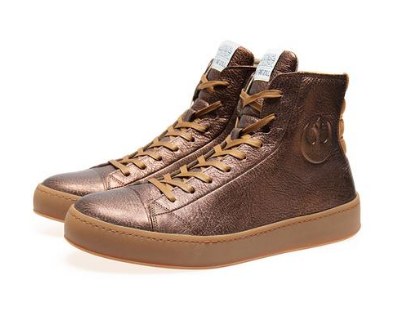 A Limited-Edition High-Top Bronze Resistance Sneaker for men, under license with Lucasfilm and Disney. Star Wars fans and sneaker collectors now have the opportunity to order 1 of the 1,000 limited production run; each pair stamped with a unique number on the tongue’s lining (see close-up image). Handcrafted in Portugal, these Limited-Edition Sneakers are made from chrome-free leather, and featuring a rasied-emboss official Rebel Alliance symbol, cushioned tongue, quilted rear panel, removable memory foam Foot-Mattress™ (allows orthotics placement), and a high performance grip natural latex sole. 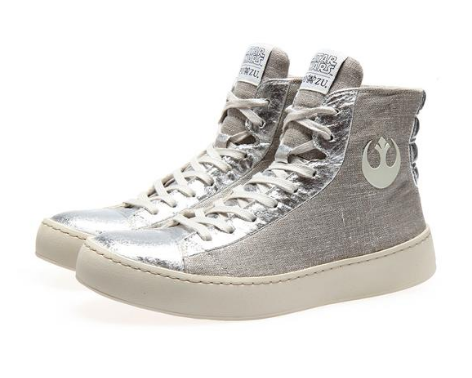 A Limited-Edition High-Top Silver Resistance Sneaker for women, under license with Lucasfilm and Disney.